Still, there are times when even my well-documented cynicism has to be put on hold, and the overwhelming sense of camaraderie and positive energy of last night’s show was certainly one such occasion. Of course I wasn’t to know any of this at the start of the evening, as British bruisers Unfathomable Ruination struggled their way manfully through a solid set (including one brand new song, which you can get an ear-full of below) that never really managed to find its footing or connect with the audience like it should have. Mostly I think this was down to the venue and the sound, as the general layout and feel of The Loft has a certain blandness and soullessness to it that’s not easy to overcome, particularly when the venue is only half full and the group’s sound is noticeably (and notably) thinner than the bands who would come after them. Of course none of this should be placed on the band’s shoulders, as they definitely tried their best. It just so happened that tonight wasn’t their night. I definitely recommend checking out their most recent album, Finitude, however, especially since I once recommended it as one of the best (and most brutal) albums of 2016. Having just finished a major US headlining tour, it’s no surprise that Mancunian Slam Kings Ingested were full of confidence this evening, and this confidence (combined with a much bigger, and much more appreciative, crowd, as well as a much bigger, beefier sound) definitely helped them to overcome some of the drawbacks and difficulties which had kept Unfathomable Ruination’s set from igniting. Bullish and exuberant frontman Jay Evans quickly had the audience eating out of the palm of his hand with his banterous mix of good-natured profanity and winking self-deprecation, while the rest of the band chugged and chundered their way through a brief but bombastic set of material largely culled from their fantastic new album The Level Above Human, a record which saw the quintet finally escaping the restrictions of the slam/core ghetto to become a proper Death Metal force in their own right. Granted, their over-reliance on bass bombs (averaging at around four per song) is still a little amusing (though not necessarily in a bad way), but that didn’t stop their all-too-short set being a heck of a lot of unabashed and unpretentious fun. 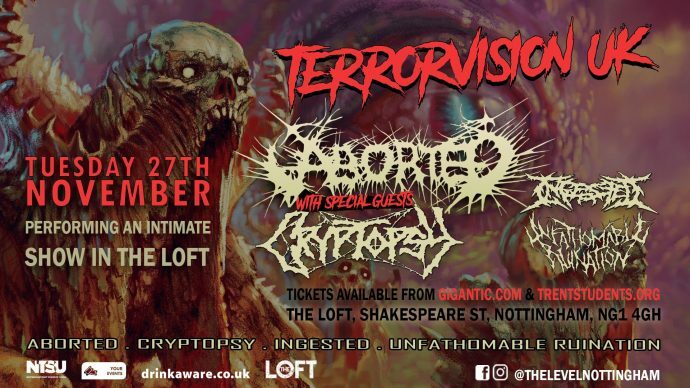 I may have mentioned this oh, once or twice (or a hundred times), but our show opening for Cryptopsy in London last year was one of the best we’ve ever played, with a massive crowd, a massive sound, and just an overall brilliant vibe. The one downside of the night, however, was that I ended up manning our merch table for the majority of the evening after our set and so wasn’t able to catch much of the band’s show… although at the time I didn’t mind this too much since I’d already caught them at MDF earlier in the year. There were no such extraneous demands on my time last night, however, which meant I was free to grab a good spot (as well as another beer) just to the left of the stage in order to watch Messrs. Mounier, Donaldson, Pinard, and McGachy strut their funky stuff. And strut they did, picking up right where Ingested left off and ramping up the energy and intensity of the evening even further with an absolutely devastating set of material that seemed tailor-made to cater to my own personal preferences, leaning heavily on both of the band’s recent Book of Suffering EPs and the classic None So Vile, with a few extra cuts from Whisper Supremacy and their 2012 self-titled effort thrown in for good measure. But while Mounier’s drumming remains the star of the show for the most part, tonight’s set really brought home just how impressive (not to mention woefully underrated) the furious fretwork of Christian Donaldson really is, and how important his style of playing has been to the overall sound and success of the band since their rebirth, with his single guitar frequently seeming to do the work of two other instruments without ever missing a beat. As impressive as Cryptopsy’s set was, however (and, going into the evening, I had fully expected them to steal the show). Aborted’s performance was on another level entirely. Despite being down a member for the UK leg of their current tour schedule, the band delivered all the hellraising hooks and scorching sonic savagery you could possibly ask for over the course of 50-ish minutes of pure Death Metal devastation. It’s easy to forget sometimes that Aborted are now ten albums deep into an almost twenty-year career and have, for many people, become the undeniable and unforgettable face (and voice) of an entire genre, but tonight was a chance for the band to remind everyone just why they’re one of the biggest and most celebrated bands in Death Metal by smashing their way through a consummately crushing set which spanned almost their entire discography, beginning with the title-track to their latest album, TerrorVision, and culminating with a rampaging rendition of “The Holocaust Incarnate” from 2001’s Engineering the Dead. Along the way the quartet also treated us to several killer cuts from Goremageddon, Global Flatline, and Retrogore, along with several more numbers from TerrorVision, plus an unexpected (but welcome) return to The Archaic Abattoir for the deep-cut classic “Hecatomb”. Utterly blistering from start to finish, the band’s set got practically the entire crowd moving and grooving, and supplied more riffs, more blasts, more hooks, and – most importantly – more atmosphere than any of the preceding acts. Which, considering the imposingly high quality of all the bands on this tour package, is high praise indeed. Ultimately this evening wasn’t just a reminder of how stunningly good Aborted are live, but a reaffirmation of just how refreshing and life-affirming a good Death Metal show can be.